I love this sword! It arrived in the mail quicker than I had expected. The blade is strong and sharp. The hilt had a scuff or two, but I don't mind - adds character. I'd give this 10 stars if I could. This is one of my favorite swords I have ever got from BudK. I love the awesome feel to it, it has the perfect weight, and when I hold it, I have the natural urge to slash some Celtic enemies with it! If it were a real sword and not for show, I would definitely take it to war with a kilt on the Celtic battlefield. Looks very good. Feels solid and well balanced. Blade, wooden hilt and brass-work all look quite good. Blade came sharpened and edge needs only a little touch-up. Sheath seems reasonably sturdy. A good buy for the price. This sword has a good balance (the center of balance is roughly 2.5 inches from the cross-gaurd) and feels good to swing. The blade is not sharp out of the box, but that is easily fixed. I tested the sword on some stumps and logs, and it cut fairly well for a dull blade, although the threaded pommel loosens quickly, forcing you to continuously tighten it. The sheaths belt loop is held to the sheath by two metal rings, and it broke after only a few minutes of wearing. You can easily fix this by attaching a heavy duty ring or wire, but this is still inconvenient. I suggest this if you want to hang it on a wall, but if you want a sword for dueling look somewhere else. This is a pretty dam good sword, sturdy, well weighted, fine blade, it did come dull but that's an easy fix, the hilt is my favorite part, it feels epic when I hold it, I've been swinging around ever since I got it, realized quite quickly that it takes quite a bit of energy to swing for a long period of time, the only problem I have with it is the Pakistan stamp on the blade, one side of the blade near the tip looks like it was bent, probably was hit or something, a good buy though, will enjoy it for as long as I have it. 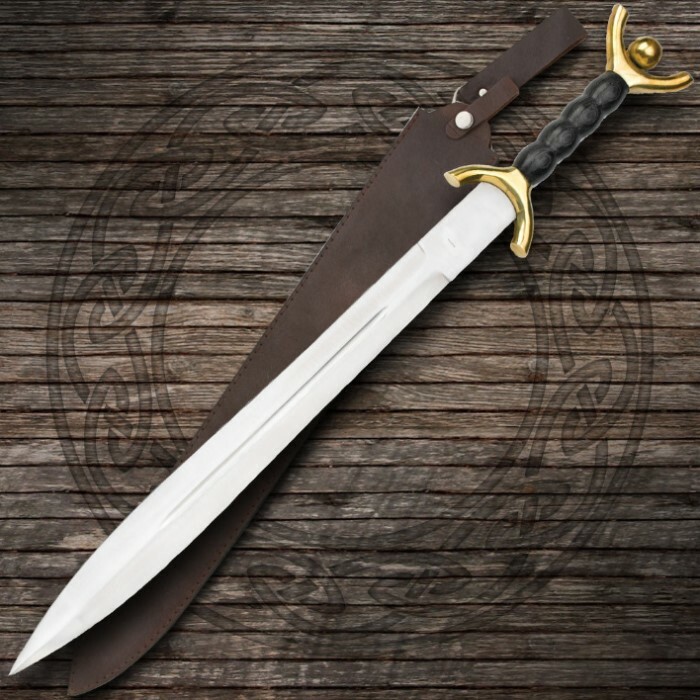 I'm of Celtic ancestry and this sword is an amazing addition to my collection. Thanks Budk! This sword is awesome! It's beautiful, lightweight and well balanced. The only drawbacks I can see is that it's not very sharp right out of the box, but I took care of that easily. It also has a wobbly wooden handle. I'm in the process of re-doing the handle. I'm cutting the handle off and making a new one out of two wooden slats with a leather grip for better balance and grip. I'm definitely gonna get another one because I'm a dual-wielder and just have to have that second beauty! Also! ~ Super Fast Shipping! Wonderful piece for display. It is also well balanced and easy to use. Weight is about perfect for just about anyone. Highly recommend to anyone that is into collecting and/or is of Celtic ancestry. 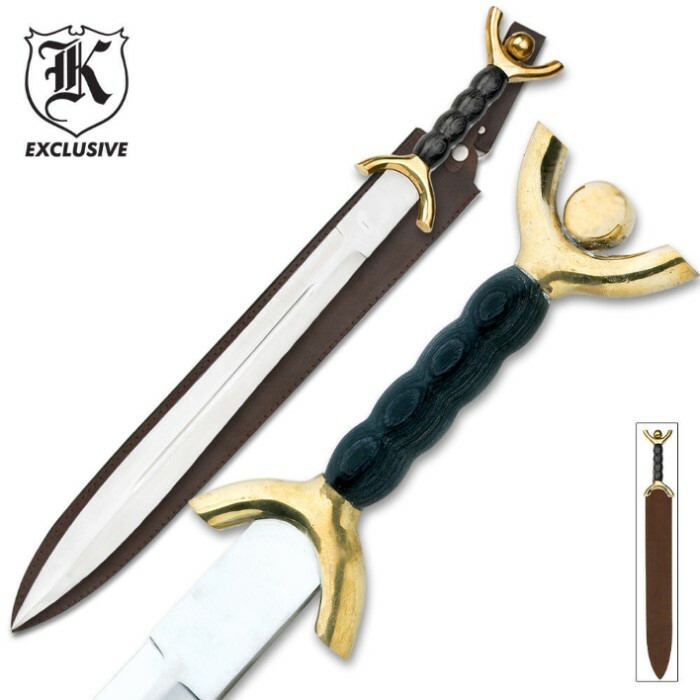 This is a great sword for the price. It has a very nice appearance and it is well balanced. It does arrive a bit dull but I was able to sharpen it pretty quickly.